Eleven Lessons in the Ancient Science of Bhakti-Yoga. This compact guidebook of essential spiritual teachings shows us how to choose a guru, how to practice yoga, even where to live. Originally written in Sanskrit by Srila Rupa Gosvami the greatest spiritual genius of medieval India. "When I am eager to understand the literature given by the Gosvamis, then I shall be able to understand the transcendental loving affairs of Radha and Krishna." Sri Caitanya Mahaprabhu appeared in order to bestow upon human society the benediction of the science of Krishna. The most exalted of all the activities of Lord Krishna are His pastimes of conjugal love with the gopis. Sri Caitanya Mahaprabhu appeared in the mood of Srimati Radharani, the best of the gopis. Therefore, to understand the mission of Lord Sri Caitanya Mahaprabhu and follow in His footsteps, one must very seriously follow in the footsteps of the six Gosvamis--Sri Rupa, Sanatana, Bhatta Raghunatha, Sri Jiva, Gopala Bhatta and Dasa Raghunatha. 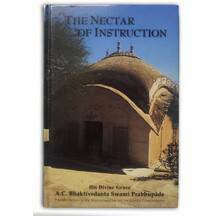 Sri Rupa Gosvami was the leader of all the Gosvamis, and to guide our activities he gave us this Upadesamrta (The Nectar of Instruction) to follow. As Sri Caitanya Mahaprabhu left behind Him the eight verses known as Siksastaka, Rupa Gosvami gave us Upadesamrta so that we may become pure Vaisnavas. In all spiritual affairs, one's first duty is to control his mind and senses. Unless one controls his mind and senses, one cannot make any advancement in spiritual life. Everyone within this material world is engrossed in the modes of passion and ignorance. One must promote himself to the platform of goodness, sattva-guna, by following the instructions of Rupa Gosvami, and then everything concerning how to make further progress will be revealed. Advancement in Krishna consciousness depends on the attitude of the follower. A follower of the Krishna consciousness movement should become a perfect gosvami. Vaisnavas are generally known as gosvamis. 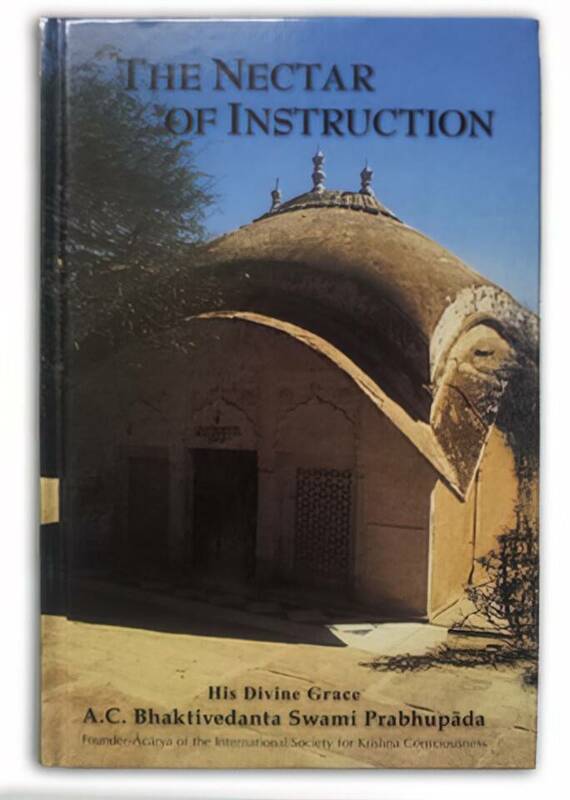 In Vrndavana, this is the title by which the director of each temple is known. One who wants to become a perfect devotee of Krishna must become a gosvami. Go means "the senses," and svami means "the master." Unless one controls his senses and mind, one cannot become a gosvami. To achieve the highest success in life by becoming a gosvami and then a pure devotee of the Lord, one must follow the instructions known as Upadesamrta, which have been given by Srila Rupa Gosvami. Srila Rupa Gosvami has given many other books, such as Bhakti-rasamrta-sindhu, Vidagdha-madhava and Lalita-madhava, but Upadesamrta constitutes the first instructions for neophyte devotees. One should follow these instructions very strictly. Then it will be easier to make one's life successful. Hare Krishna.